1955 North American made in Warsaw IN. 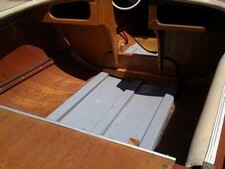 What is the best product to strip my paint and varnish covered boat? How do I find the year and make of my boat? To the best of my knowledge it is an early 50s American or North American made in Michigan or Indiana. The motor is a Mercry 700 and think it is about a 1955. 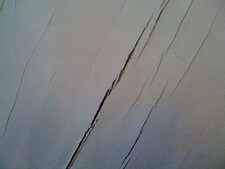 Thanks Mike, There is no or very minor dry-rot. From what I can see of the damage in the photos it looks as though it is just the surface veneer which has cracked and is laminating slightly along the cracks. Is there any actual rot? If there isn?t then there is not much point using any of the various products that purport to cure rot. All they do is kill off the spores, they cannot restore the wood. From what I can see, you want to sand the damaged area back to bare, sound wood, and then seal it with epoxy resin. Then use resin mixed with a faring thickener to smooth it off. West systems do a range of thickeners, most are strong and sand easily. For the any areas where you want a natural wood finish you could try mixing sawdust into the epoxy to thicken it. 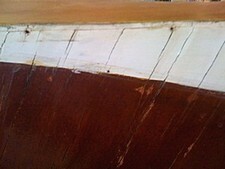 There are fillers which can be stained but getting the color to match the existing wood is nigh on impossible. All I can suggest is that you experiment on some scrap wood first to check how it is going to look. But it depends on the sort of area which needs filling. Fine cracks look best treated with a dark colored filler, on large areas it might be better to strip off and replace the top veneer. I would like to have some help with how to epoxy the plywood as I have only about a 4' by 2' area that needs repair. As the wood is all original, would like to keep the wood and have read some about products that stop dry-rot and not sure if I should use this and then what should I fill with that will take both pant and stain filler. 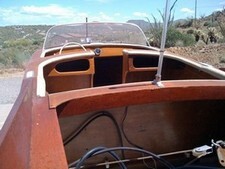 I have included a picture or two of the rot and other pictures of the boat. 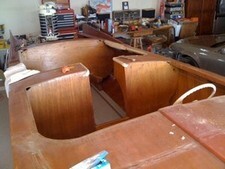 I have knowledge of refinishing furniture but now so much with restoration. Could any one recommend an epoxy and filler that I will be able to stain and what stain filler, paint, and stain I should use. 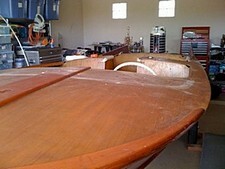 If you would like to put some more photos on here you can email them to me at mike@diy-wood-boat.com. My email address is phimelick@mac.com and would be happy to send some more pictures if you will email me. Love your boat. 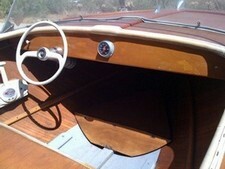 I have a home built boat that looks real close to your's. It was built around 1957 from plans my father in law had aquired from the Douglas Fir Plywood Association. Do you have anymore photo's of your boat that I could see? It isn't that bad so will glue and clamp. Then plan to use filler stain to resurface. So what is your plan for the delaminating ply? Replace the whole sheet or epoxy it back together. Persoanlly I would epoxy the area and build it up with filler. 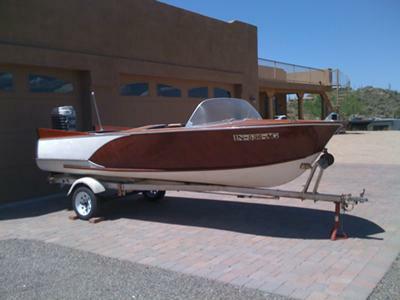 My father purchased the boat in 1956 and at that time it had a circular decal on the sides in the white pant area above the stern splash rail with the manufacture name just not sure but thought it was American or maybe North American, I just don?t remember. The trailer was also manufactured for the boat and had a torsion bar suspension with we replaced with leaf springs when we could not purchase a replacement. 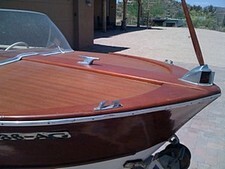 The boat is in good condition as it was wet sanded and new paint and varnish about three times when I was using it from 1956 thru 1971. However, I just pulled it from storage and although it looks good from a distance some of the paint and varnish has started to peal and some of the plywood seams in the painted part have started to delaminate. Although this is limited I think it is time for a good restoration. Nice boat!! Looks like the batmobile with the fins! If the boat was built professionally there is likely a name plate somewhere, however there are lots of homemade and kit boats around from that era too. Then I stopped in at a restoration shop and found they used 1850 furniture stripper. What a dream, It took all the layers off in one shot, never raised any grain and washed off with water. I would use it again hands down. As Mike mentioned above, do you really need it stripped? In that shot it looks good, Maybe you just need a wet sanding to even everything out then re-varnish? I take it that there is no sign of a makers name plate anywhere? The paint work looks good in the photograph but I guess you wouldn?t be asking about stripping if she didn?t need a repaint. I'm afraid the easy answer to your paint stripping question is that there is no easy answer. My own view is that scrapers, sanders and plenty of elbow grease are the best way to go. There is quite a bit of discussion and various opinions on the subject in this post about using sanders on paint. And some more here about removing old varnish.